dissolved starch (combine half TB of starch with 4 T of cool water). 1. Soak mushrooms in water till softened; remove stems, sliced and chopped. 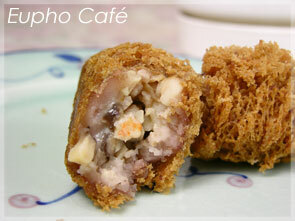 Slightly freeze pork and shrimp, then chopped into small chunks. Heat 2 TB of oil in skillet, stir fry minced garlice, then stir in pork, shrimps, and mushrooms; when cooked, add seasonings and stir well; turn off the heat and let cool. 2. 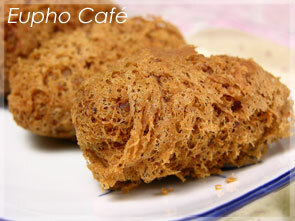 Cut taro into slices in thickness of about 1 cm. Arrange loosely in a steamer, steam till thoroughly cooked. Remove from steamer and smash while it’s still hot. 3. Stir 3/4 cup of boiling water into wheat starch with a fork to form a rough dough. When the temperature dropped a little bit (still hot, butdoesn’t hurt your hands), combine the dough with mashed taro, and then add lard, soda, salt and sugar, fold in and knead completely. Please see attached picture A for the fully combined dough. 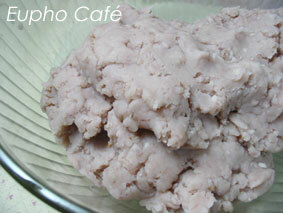 * You'll need to get rid of the taro lumps found in the dough while kneading it. 4. Roll the dough to form a ball, cut into 4 parts, and then roll each part into a stick, and cut into 6 pieces. 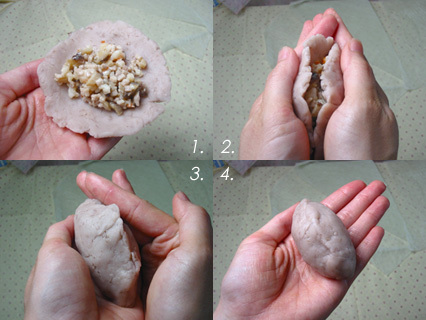 For each piece of dough, roll it out to a dumpling wrap, scoop fillings on top, and then hold the dumpling in your hands to form an oval-shaped dumpling; see attached picture B. 5. 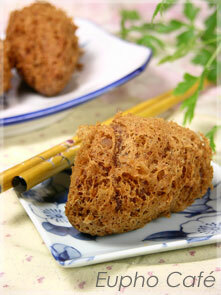 Place dumplings in a drainer and deep-fry in high heat till color turns brown and the skin is covered with crispy nettings. Drain, and leave on paper towels to get rid of excess oil. 1. 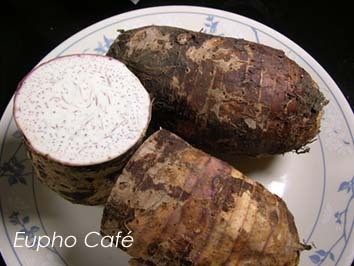 This kind of taro is usually very big in size, just a little bit smaller than a pineapple. When choosing a taro, pick those are lighter in weight because they contain less liquid and would be the best choice for making this dessert. 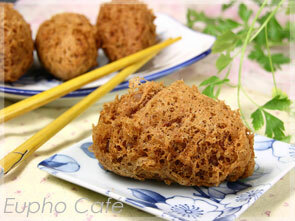 After you steamed the taro, the texture should be dry and almost powder-like. 2. The key point for making it should be the temperature of the frying oil. If the temperature is too high, then the color would trun brown quickly and the netting effect on the skin would fail to come out. If the temperature is too low, the skin would be peeled off and the filling might start leaking while the skin is broken. The way how I test the temperature of the oil is that, drop a taro lump (remember? we got some lumps while kneading the dough.) into the oil, it should sink to the bottom and stay there for one second, and then float up to the surface quickly. If you're still confused about the temperature, just try different heat settings, and you should be able to figure it out after few trials. 3. If substitute the lard with unsalted butter, remember to remove it from the refrigerator earlier to have it softened. 4. Fried dumplings should always be finished as soon as possible because the crispy skin will turn soggy and greasy in few hours.